Update: Official TWRP for OnePlus 6 is now available for download. You can use the installing TWRP method as well to root OnePlus 6 on latest Oxygen OS update or the Android P Beta. OnePlus 6 is the latest flagship phone from the OnePlus manufacturer. This time, the device made a significant sales across the globe, which could make the OnePlus 6 their best selling Android device ever. It also comes with the latest Android 8.1 Oreo out of the box. This means a lot because Android P is readily available via Project Treble. Now, a lot of you may be interested in getting the most out of their devices. So here in this tutorial, we will show you how to root OnePlus 6 and also Unlock the Bootloader, and install TWRP recovery (whenever available). There could be several reasons why you would want to root your Android phone. Some of which could be flashing a custom ROM like Lineage OS, Resurrection Remix, Paranoid Android, etc. Some of you may want additional customization options like changing themes using Substratum. Some of you may like to install mods available via Magisk Manager or Xposed Framework. These are some of the many benefits of rooting Android. Also, OnePlus is one of the few smartphone manufacturer which are pro custom development. Rooting won’t void the device warranty. But you should still consult with OnePlus support. Although this procedure has been testes working with several devices, you should be cautious and gain enough information over rooting and then begin. How to Unlock Bootloader and install TWRP recovery for OnePlus 6? Step 1: Enable OEM Unlock, USB Debugging, and Advanced Reboot on your Android device. First, enable Developer Options by going to Settings > About Phone > Tap on the Build Number several times. Step 2: You will also need to setup ADB and Fastboot on your PC. Download the 15 second ADB and Fastboot for Windows, Mac OS, or Linux OS. Step 3: Connect OnePlus device to PC using USB cable. Trust the connection by allowing it when you connect it to your PC for the first time. Check “Always allow from this computer”. Step 4: Open a command prompt window or CMD. Now keep the Android device plugged in and open a command prompt or terminal on your PC. You can simply click the address/location bar in Windows and type “cmd” if you have setup the 15 sec ADB installer. Alternatively, hold the shift key on the keyboard and right-click on an empty space and select “Open command window here” option to launch a cmd window. Alternative: If you have enabled Advanced reboot option, then press and hold the Power button and choose Reboot to Bootloader. 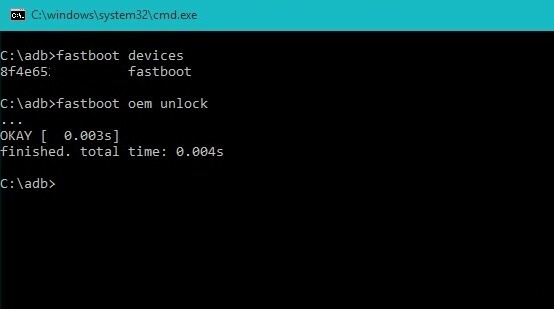 For some devices it’s fastboot oem device-info. If the device unlock status returns false, proceed below. Note: If the procedure is finished and returns true, reboot to system and your device will have an Unlocked Bootloader. You should check the device info again by going through the same procedure and find the device unlock status or info. If unlocked, proceed. Now that TWRP recovery is not available for OnePlus 6, we are going to flash a Magisk modified or patched Boot image. Unlocked Bootloader is a must. Enable OEM Unlock, USB Debugging, and Advanced Reboot on your Android device. Your device must be on the latest Oxygen OS 5.1.5 firmware update. Download the boot image for OnePlus 6 device for OxygenOS 5.1.5 from download here to PC. Transfer the patched zip image to PC. Open up your cmd or terminal where you’ve downloaded or placed patched boot image. Once the flashing completes, phone will reboot into system. If not, reboot manually. From the system, install latest Magisk Manager app and open it. Magisk Manager App should show a rooted phone. But at this stage, it’s just temporary. Go to settings and Tap on “Update channel” and change it to Beta. Go back to Magisk main screen and make sure that “Preserve force encryption” and “Preserve AVB 2.0/dm-verity” are checked! After first reboot, there should be no error messages. Open up Magisk Manager once again and tap on “Tap to start SafetyNet check”. It should be all green. How to install TWRP recovery on OnePlus 6? Now that you have successfully unlocked the bootloader, you can easily setup a custom TWRP recovery and flash SuperSU/Magisk to root. Once the TWRP recovery is available, you can move forward to the following steps. But for now, you can directly head over to rooting tutorial. Step 1: Download TWRP recovery for your device from here. Transfer the TWRP Installer zip to device storage. Also place a copy of it on your PC. Extract it to get the img file. Step 2: Now reboot back into the Fastboot mode (Bootloader mode). See steps 1 to 5 above in Unlock Bootloader method. Step 5: Flash twp-installer zip from within the TWRP by clicking the install option of phone screen. For Mac OS, use commands like “./fastboot flash recovery <filename>.img” and for Linux OS, use commands like “sudo fastboot flash recovery <filename>.img” to flash the TWRP. Transfer latest Magisk zip to phone storage or SD card. Reboot OnePlus 6 into TWRP recovery. To do so, turn off your device completely and hold volume down and power buttons for a few seconds. Now, tap on the Install option and select the Magisk file. Video: We have made a short video tutorial on how to Unlock Bootloader on the OnePlus devices. Though it is for the OnePlus 3, the procedure is same for the OnePlus 6 as well. Video 2: How to install TWRP and root OnePlus devices using Magisk or SuperSU? Next Entry Download YouTube Music APK – How to Install YouTube Music and Use Anywhere in the world?